A lot has been happening, even if it’s not a lot of new Odori Park comics. 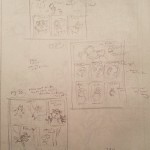 I will say I’ve been contemplating how and when to best return to making OP strips, but if you’ve read my blog posts in the past, you know my focus this past year has been a graphic novel project. More on that in a second. First, I wanted to slip in a plug for Alex Heberling, an online friend (and rival–don’t think I haven’t forgotten my humiliating loss in the TGT podcast brackets, Heberling!) who’s drumming up funds via Kickstarter to publish the first collection of her newest comic, The Hues. It’s a beautifully illustrated full-color (of course) magical girl adventure that I’m looking forward to seeing in print form. Please have a look, and consider pledging. 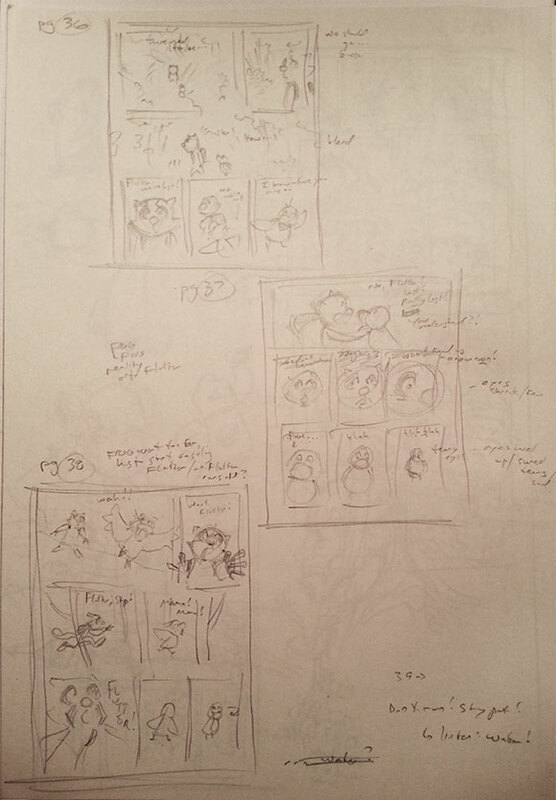 See, I’m still hip-deep in the scripting stage, but decided to merge this with the thumbnailing stage. After all, I’m really the only one to whom these scribbles need to make sense, so why take the extra time of scripting it out formally in text first. Especially when I think just as visually as verbally about comics. But that means there’s literally not much to look at–at least not much that’ll make sense to anyone who’s not me. In any event, even though balancing the kids and the day job keeps the work slow, it is progressing. In the meantime, I was recently contacted by Carla Ventresca and Henry Beckett, creators of the syndicated strip On a Claire Day, who are also the creators of a new mobile comic site called Comikka. It’s a fun way to read comics on smartphones and other small-screen devices, and I’m excited to get my Odori Park library up and running there for a new batch of readers to find! Carla and Henry have figured out a neat way to help the cartoonists make some money for their work by inserting interstitial ads in the strip flow, but at a frequency and insertion point of the cartoonist’s choosing. There are a few strips already that Carla uploaded to get me started, and although I’m (as ever) slow to get things cooking, I’m looking forward to posting more of the archive there. Please check it out, and read some of the other cool comics there!